Lysle Whitmer from the Iowa State University walked the length of the bio-oil production facility, starting from the 55-gallon solvent tank to the twin-screw extruder with its chopping, mixing, pressurizing, and heating functions, and then to the reactor in the middle and to the product separators, and finally to the solvent recycling system. 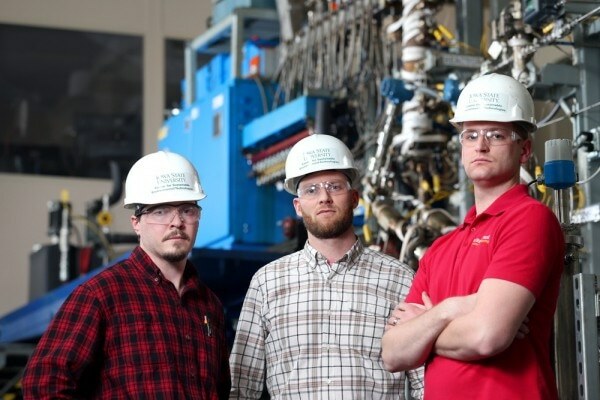 Whitmer, the senior thermochemical research engineer for Iowa State’s Bioeconomy Institute, stated that special expertise is required to synchronize and make all of the operations function together. This is the culmination of everything we’ve learned about building pilot plants in the past 10 years. This is really a gem that represents everything we’ve learned thus far. This recent pilot plant at Iowa State’s BioCentury Research Farm is a joint venture in collaboration with Chevron U.S.A. Presently, university engineers are involved in development and demonstration of an advanced biorenewables technology known as solvent liquefaction at this pilot plant. As a result, they are trying to produce a bio-oil from biomass like quarter-inch wood chips. This bio-oil can be further processed into biochar that can enrich soils and also can be used to obtain certain chemicals or fuels. A four-year grant obtained by Iowa State University from the U.S. Department of Energy’s Biomass Research and Development Initiative worth $3.5million will be supporting this research work. The Chevron-Iowa State partnership started in 2013 when the company relocated its $1.4million small continuous liquefaction unit from Houston to the research farm located towards the west of Ames. The company was in pursuit of a research partner that will help them in developing the plant for continuous production and will also help in building a system that can recycle the solvent back into the production process. Chevron has now donated the pilot plant to Iowa State as part of the agreement. Our modular approach to the plant design allowed for a fair amount of prototyping and proof-of-concept experiments along the way. The system is a blend of commercially available products and custom solutions, all tied together at an industrially relevant scale. All of these efforts helped us end up where we are now, with a safe and functioning pilot plant. The solvent liquefaction technology that is being utilized in the pilot plant was initially developed by Chevron. The initial step of the process involves a proprietary solvent that is mixed with solid biomass or wood chips. The mixture is then processed under moderate pressures and temperatures, after which the resulting slurry is released into a reactor. Following heating in the reactor, the production process is divided into two processing streams. The upper stream handles vapors and gases, while the lower stream handles small amounts of solids and liquids. A chain of separators and filters together with streams recover small amounts of biochar, bio-oil, and solvent for recycling. This process results in a bio-oil that has low levels of oxygen, and hence increasingly stable as compared to other bio-oils. With the work Chevron did, this looked like it could be a very cost-effective method for producing biofuels, but many of the unit operations hadn’t been tested, so the team has been working to design and optimize these operations. According to Whitmer, the engineers have now demonstrated the feasibility of all the pilot plant’s operations. They are still working towards simultaneously and efficiently performing all of the operations of the pilot plant. Whitmer further stated that the pilot plant functions about once a week. It has the capacity of processing around a pound of biomass every hour, and can normally function for 15-18 hours at a time. Brown said that, the next step of the project is to include functioning with new feedstocks in order to create high-value, biorenewable chemicals. Project leaders are convinced with the pilot plant’s progress until now.